AgriGro's Turf Formula Biostimulant is an All Natural, environmentally safe, Soil and Plant Fertility Booster and Biostimulant. Developed by a bio-chemist, Turf Formula Biostimulant can be used on all grass types and all turf situations. 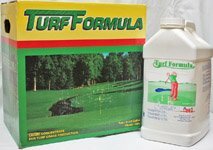 Golf course superintendents around the country have been using Turf Formula on their greens, tees and fairways for years. The benefits are numerous and include better nutrient uptake, increased root mass, massive increase in microbial activity that produces stronger and healthier plants. But this is only the beginning of what it does. Certified research has shown that soil microbes increased 3400% in 24 hours* after application resulting in more available soil nutrients, lighter and more aerated soil, and a decrease in many soil born pathogens and parasitic nematodes. The high increase of beneficial soil microbes feed upon pathogenic bacteria. *Research was performed by the University of Missouri/Columbia. Turf Formula Biostimulant was used with Super-Cal Liquid Calcium when the tests were performed. Turf managers are able to reduce fertilizer nutrient inputs by as much as 30% due to the increase in microbial activity and their mineralization of soil elements. That is a great benefit to the environment. Some commercial home lawn care companies are using Turf Formula Biostimulant as their primary method of fertilization and adding other nutrients as needed. Turf Formula Biostimulant works equally well on many other plants, too. How Does This Unique Formula Work? "I have been using the Turf Formula since May (2017). Russ, my lawn is phenomenal! It has never looked this good. It is thick, dark green and looks amazing. I now have grass growing where I could never grow grass before and it looks incredible!" The unique Turf Formula Biostimulant blend contains plant essential by-products created by the controlled activity of beneficial aerobic and anaerobic bacteria. Beneficial bacteria convert raw materials into plant usable substances, including essential enzymes, micronutrients, plant growth hormones, salicylic acid, amino acids, complex carbohydrates, and other important ingredients. When taken up into plants, it increases photosynthesis, disease resistance, nutrient storage and absorption, carbon fixation, root growth, and other important plant functions. What Will Turf Formula Do in the Soil? Plant life begins in the soil and soil microorganisms are the key to healthy soil. In tests conducted by Morning Star Labs, Moonpark, CA, Turf Formula increased soil microbial activity by 2000% in the first three days using the biostimulant alone. Soil was more aerified and lighter due to the microbial activity. University of Missouri/Columbia combined the Turf Formula with Super-Cal with even greater effects on soil microorganism activity. Mycorrhizae fungi were greatly increased. Mycorrhizea is a vital beneficial fungi that colonize on plant roots and help roots absorb water and nutrients and actually extends the reach of roots. In addition, research demonstrated that plant root mass increased by 35% over untreated plots. The increased root mass is able to take up more nutrients and water making the soil more productive. The increase in soil microorganisms working the soil increases the available nutrients and makes uptake more efficient. Turf Formula Biostimulant users have reported a decrease in diseases, including soil born pathogens and nematodes. In short, you get a proven product that increases nutrient efficiency, while increasing root mass and microbial activity. This combination will increase plant health and reduce disease and fertilizer inputs and so much more. Turf Formula Biostimulant is best when combined with Super-Cal Liquid Calcium. This is especially important in low pH soils. Super-Cal Calcium is an immediately available calcium source that is essential for root strength and penetration. Calcium strengthens cell walls and is necessary to maintain high microbial activity. Bountiful Harvest Biostimulant creates an explosion of microorganisms breaking down organic matter and soil elements for plant use. It promotes rapid root growth, plant and fruit growth, increases disease resistance, and plant health. Simply mix with water and spray it on your plants, soil, seeds, trees, flowers, and anything that grows. There is an explosion of soil microbial activity in the first 24 hours of application. University research shows over 2000% increase in 24 hours and when combined with Super-Cal, it increases to 3400%. This means greater nutrient availability and increased plant health. Thousands of farmers, botanists, turf managers, and backyard gardeners are using AgriGro's Bountiful Harvests Biostimulants. You should too. Calcium is an important element needed in the high quantities by plants, but is often unavailable in the soil. Measuring soil pH alone will measure the total calcium, but will not give you the amount of calcium that is available to plants. Granulated lime can take up to two years before it is dissolved and able to be used. Super-Cal can be immediately absorbed by plants. It also contains natural organic acids that dissolves unavailable soil calcium, so it too becomes usable by plants. Calcium is needed in the largest amounts by plants compared to other nutrients. Healthy soils calcium levels equal 60% to 70% of the soil base saturation of cations. Calcium is essential for microbial life, for root growth, for firmer fruit, and strengthening cell walls, brighter flowers, and more. Calcium provides many more functions inside the plant. Low calcium produces poor quality plants and ample calcium helps produce healthy plants. Foliar Blend Biostimulant is AgriGro's all-time best selling product. It is used by farmers and growers on thousands of farms in the U.S. and in 49 countries around the world. It is now available to homeowners, community gardens, home and commercial orchards, nurseries, or anyone in need of a foliar blend biostimulant. Foliar Blend Biostimulant goes to work the moment it is applied. Microorganisms are stimulated over 2000% within 24 hours. It increases to 3400% when combined with Super-Cal Liquid Calcium. Root growth is greatly increased, plant health and growth is increased tremendously. Need proof? Check out the Bill Bader Interview. Bill owns the largest peach orchard in the Mid-West, over 1100 acres and 110,000 peach trees. He has used Foliar Blend and Super-Cal for over 20 years with great success. AgriGro "Ultra" is an OMRI Certified Organic Plant and Soil Fertility Booster and Biostimulant. It can be applied to the soil, seeds, or sprayed on the plants. It works by rapidly increasing soil microbial activity, increasing root and plant health. It contains ingredients derived from seaweed plus hormones and amino acids derived from anaerobic and aerobic bacteria, micronutrients, and more. This All Natural Organic Formula is a great addition to the organic gardener, organic lawn care operations, and growers of all types concerned about what is going into the soil. You can increase available soil nutrients and stimulating root and plant growth, while lowering additional fertilizer requirements. It can be used on trees, vegetables, flowers, or most anything you grow. Check Out This Video on AgriGro's Microbe and Soil Building Power!